untapped here in the northeast -- the sap. Cooperative Extension forester agent Jon Nute told me he thinks it's tradition. a nice niche in the maple industry. Marketing birch might be a tough sell. Perhaps all we need is a little education. birch syrup annually and marketing it as a unique Alaskan delicacy. gallon of birch syrup. Boiling works, but it takes a lot of time and fuel. expensive; another drawback for thrifty Yankees. So Why Tap Birch Trees? conference was on healing beers so she decided to give it a try with birch. weeks. She reports the results were delicious, and got even better with age. sap to make more beer and experiment with a batch of birch wine. Tapping trees, whether birch or maple, does hurt the trees to some extent. allow the trees to heal by themselves. Covering the wounds with "Band-Aids"
desirable as the others, and are certainly plentiful around New England. 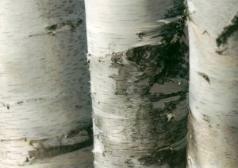 you'll be hard-pressed to find many birches that size in our region. well as candy, but you'll also find the story of how their business is evolving. questions Monday through Friday from 9:00am to 2:00pm.